Owing to dynamic market changes, managed tools or services will gain currency in near future. As operators prefer end-to-end solutions, instead of dedicated vendor / OEM software, it is predicted that the demand for managed tools / services from operators will only raise. Operators are under huge pressure to optimize cost, build efficiencies in their operations andpropel growth. They are prioritizing how quickly they can scale network capacity, efficiently managing costs, right infrastructure and finally "standing out among the competition." Telecom is a fiercely competitive domain, and operators need to do the same things but differently and proactively.Most of the operators today do not have the proper OSS implemented as per the TMForum Application Frameworx, or they are just unable to exploit existing OSS. Dedicated OEM based solutions might not be the best solution in today's changing scenarios.These solutions will become obsolete sooner than we can think - due to changing technology, availability of cost effective solutions as more and more mergers happen. The solution lies in developing an ecosystem based on standard protocols, instead of dedicated OEM specific solutions. Focused on a specific set of technology,OEM solutions work well with the intended network elements. However, such solutions are major bottleneck when it comes to scalability and multivendor support. 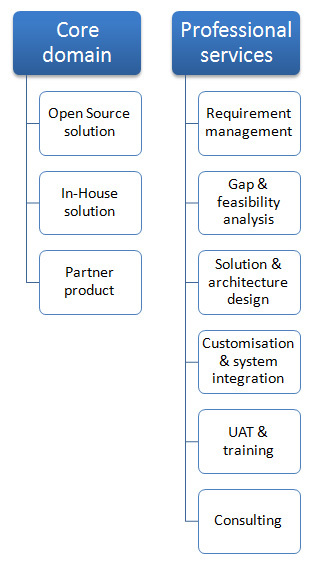 TCTS offers OEM agnostic solutions blended with proven professional services which will help quick adaptability and above all a complete eco-system for the OSS -- be it a greenfield implementation, integration requirements due to mergers and accusation or a quick cost-effective solution for a joint venture.